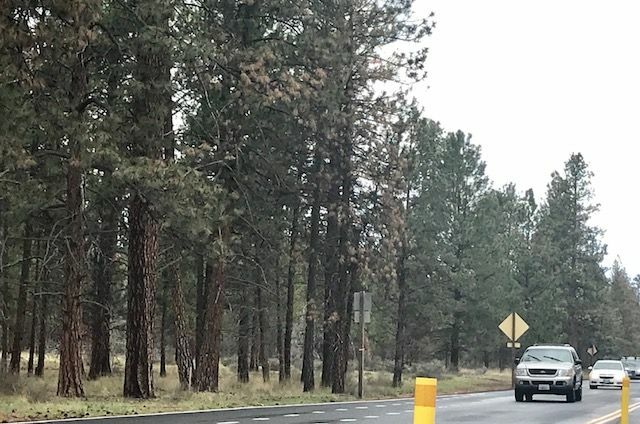 SISTERS, OR -- An herbicide proven dangerous to Ponderosa Pines was used along Highway 20 near Sisters, from 2013 to 2015, killing one in eight trees. Responding to new criticism over the dead trees, officials say the mistake was because they did not receive up-to-date information. The Oregon Department of Transportation contracted with Jefferson County Public Works to spray Perspective along the highway, in an effort to kill flammable brush and grass. After the herbicide was selected, the EPA changed the labeling to include language about the potential danger to pine trees, but ODOT's Peter Murphy says his agency did not receive the updated information prior to its application. He says ODOT, the Forest Service and Jefferson County Public Works are now working together to find a solution, "We've identified the problem and now we have to decide what our best course of action for the future is." Murphy tells KBND News, "What we need to do is figure out what our plan is for the future. We need to make sure that that's a safe highway corridor, and we have to take a look at the impact this herbicide has had, and that involves the potential mortality of the trees, and then determine a long term plan to make sure that we do the right thing." He says the public has been weighing in on the issue, "There will be a public process that allows folks to have the opportunity to hear what we think is the best solution," adding, "We want to be transparent, let people know what's going on and hear what they have to say still about what our safety action plan would be. So, we're working together with the forest service to develop that, and as for specifics, we just haven't gotten there yet."